We got there a little late and missed half of Oleander’s set. I’m assuming it was the same set from the Artvoice Festival the prior Sunday, we managed to catch Unwind, Benign, Why I’m Here, and Are You There. Then Seven Mary Three came out, and put on a great show. They opened with First Time Believer, then went to the older stuff, playing Water’s Edge, Roderigo (which I yelled for, and Jason Ross was like, “You read my mind! Giti also commented on that as he was signing my stuff), Steal A Car, Lucky, Sleepwalking, My My, Peel, Breakdown, Wait, and closed with Cumbersome. They sounded really good, but seem to be the type of band that you have to see in a club. The crowd was rather lame for both opening bands, not sure if they were just unfamiliar or what. 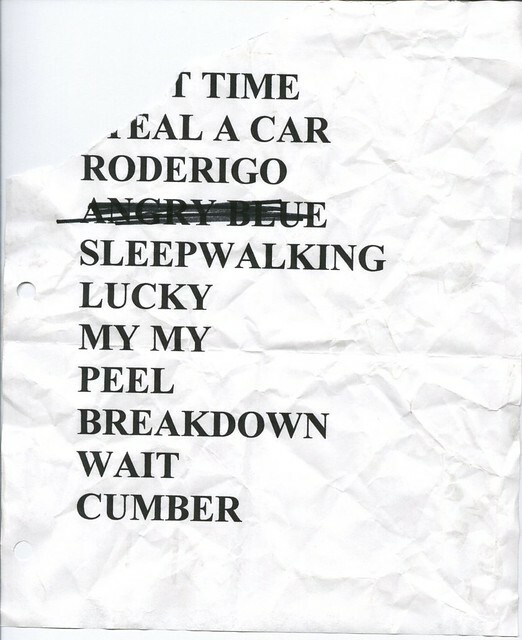 After the 7M3 set, we hung around by the buses and got autographs from the all of the 7M3 guys, and Mary managed to snag a 7M3 setlist which ended up being a little different from what they actually played. Then we wandered to the back of the concert area, and found Doug from Oleander so we got autographs from him and talked for a little bit. Not long after Ric and Scott from Oleander appeared as well, so we got to chat with them too. All the Oleander guys are really nice and down to earth! We split and half-heartedly watched 3DD, they opened with Duck and Run, played everything off “The Better Life”, including Be Like That acoustically, and closed with Loser. They also did about 4 or 5 new/old songs, and some setlist.fm investigation would suggest we saw When I’m Gone, Dangerous Game, This Time, maybe Sarah Yellin, and one of either Dead Love or Wasted Me from the indie. They have this new 3EB-esque stainless steel stage setup with risers going up and behind the drummer, kinda overdoing it IMHO, but whatever. They sounded decent, but the show hasn’t really changed over the 4 times I’ve seen them.